With locations in Escanaba, Michigan and Marquette, Michigan, our company has the team, equipment, and ability to provide service to all of the surrounding areas including Escanaba, Marquette, Gladstone, Iron Mountain, and Menominee and have been serving the area for many years and is considered today as one of the top Green Industry Professionals in the area. We know homeowners here want the best for their lawns and landscape, have exquisite tastes and don’t settle for less than perfection. This is why Olson’s Lawnscape made it its mission to meet and exceed all clients’ expectations. Olson’s Lawnscape is a horticultural company focused on the customer. We offer year-round, time-honored and integrated lawn care and landscaping programs as our main goal is to establish mutually beneficial and strong relationships with our community members. This is why, along the years, we perfected a wide range of cost-effective solutions for our clients that are in full compliance with the industry’s standards. We are proud to say that we raised the bar quite high when it comes to our services and our loyal and growing pool of customers can vouch for our excellency. Reading our customers’ reviews may not be enough, as many similar companies promise the same things. However, you can personally put us to the test. 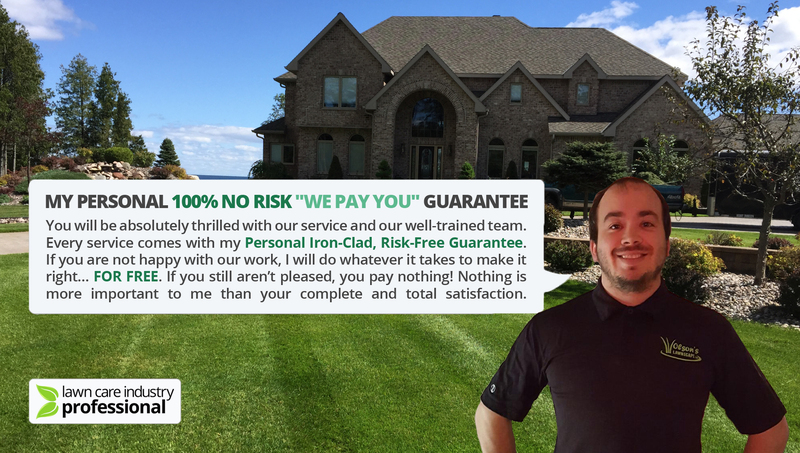 Besides presenting you with top licensed and certified professionals and offering you personalized pricing plans, we back each of our services with our personal iron-clad, risk-free guarantee. If you are not happy with our work, we will do whatever it takes to make it right… FOR FREE. If you still aren’t pleased, you won’t have to pay us! Nothing is more important to us than your complete and total satisfaction. Don’t waste any more time, money and effort with lawn care and landscaping! Have a professional team take care of things while you enjoy watching your lawn and landscape thrive healthy and beautiful. Ask for a free online estimate or give us a call, we will be more than willing to put our money where our mouth is! Being successful in a competitive industry such as lawn care and landscaping means more than just using sharp lawn mower blades. It takes commitment, passion, respect, transparency and hard work to gain clients’ confidence. We always actively seek ways of improving our services while keeping prices friendly for everyone. We have created an organizational culture that promotes and rewards performance, respect, education, morals and honesty, this is why we have one of the lowest levels of employee turnovers in the industry. We understand that our clients are busy people looking for efficient solutions, this is why we expanded constantly, being now able to provide A-to-Z fully integrated, year-long services. 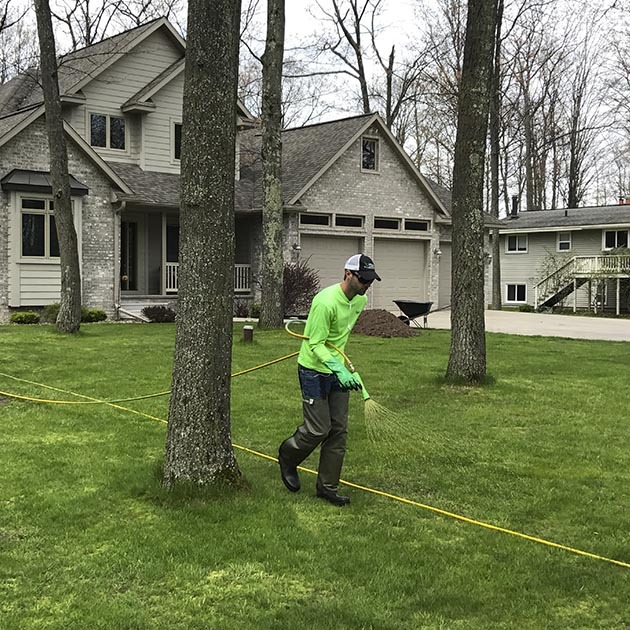 We know nobody likes to pay and supervise different contractors for different jobs, that’s why we offer complete lawn care and landscaping programs no matter the property’s size. We want our clients to maintain and raise their properties’ curb appeal and health, this is why we constantly get professional training in horticulture, landscape architecture, deicing technical procedures, and so on. We don’t neglect the importance of environmental protection, therefore we have created special fertilization and pest control techniques that also set the standards in our line of business. We know our clients want to know exactly what they bargain for, this is why our fees and taxes are straightforward, detailed and upfront, with no extra costs hidden in the fine print.